Alex directs our campaigns, oversees staff, leads our fundraising efforts, and works with our board to develop our overall strategy. He also heads up our communications and fundraising efforts. Alex came to Ride New Orleans after honing his transportation advocacy at the Coalition for Smarter Growth, the Washington DC region’s leading advocate for increased transit investment and more walkable communities. Before his work in transit advocacy, Alex developed his leadership skills and strategic sense in the world of politics and national advocacy. He managed several closely-watched congressional races, organized targeted constituencies in the 2008 presidential primaries, and led the field campaign for a national environmental coalition. He also spent several years as a reporter covering local government and media issues. Alex graduated from Webster University in St. Louis, Mo. with a degree in Journalism. He spends his free time watching the caterpillars eat his tomato and pepper plants and exploring our great city by bus and bike (his favorite bus lines are the #15 Freret (which should be much more frequent) the #91 Jackson-Esplanade, and the #94 Broad. Matthew leads Ride New Orleans’ overall work with the Coalition for Quality Transit – our grassroots, rider-led organizing arm. He also plays an important role analyzing transit policies in the region and working closely with other allied organizations. He is a graduate of the University of New Orleans where obtained a Masters degree in Urban Studies with a specialization in Anthropology. His areas of research included gentrification, local economic development, and globalization. His undergraduate degree is from the University of Washington in American Ethnic Studies. Matt is originally from Seattle and has lived in New Orleans since 2011. Don’t get him started on the Seahawks or Mariners this year, but go Sounders. Courtney works to expand RIDE’s grassroots network of transit riders through direct organizing, relationship building, and facilitating monthly transit rider meet-ups. She works with transit riders to spread their compelling individual stories of why transit improvements are so necessary for a better regional quality of life. Courtney came to RIDE New Orleans after eight years of mental health advocacy for both children and adults where she witnessed the importance of equitable and reliable transit on the lives and success of her clients. Courtney was born and raised in San Francisco, but considers New Orleans home. 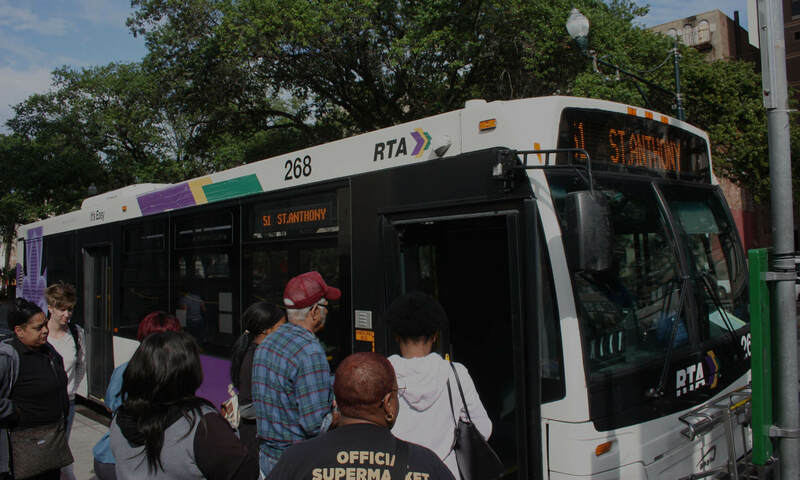 As an avid photographer, she often frequents her favorite place in New Orleans – the live Oaks of City park – which means you’ll probably catch her on the # 91 Jackson-Esplanade. Director of Program Development, Greater New Orleans, Inc.